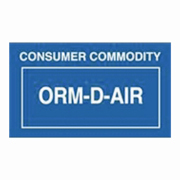 ORM-D AIR Consumer Commodity Label. These pressure-sensitive paper labels are on a roll with a 3" core. 500 labels per roll. Sold by the roll. If you do not see the label you need on our website or if you have a question, contact Spencer Patterson at spatterson@shinersusa.com or 972-988-9211. I will work with you to meet your needs.